Take a journey into the city of theaters, bars, and hotel rooms where Dorothy Parker sharpened her wit, polished her writing, and captured the edgy mood of her times. This eye-opening volume explores Mrs. Parker’s favorite salons and saloons as well as her homes and offices (most of them still intact); charts her colorful career and intense private life; and recounts her political activism, theatrical exploits, and final years. Of her hometown, Dorothy Parker wrote, “I take New York personally. I am, in fact, somewhat annoyingly tender about it. A silver cord ties me tight to my city.” Readers of A Journey into Dorothy Parker’s New York will learn why. 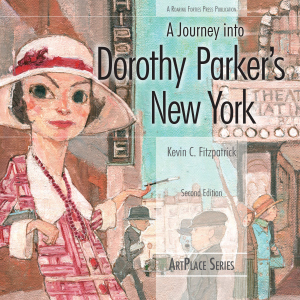 Exploring more than 100 locations associated with the celebrated wit, poet, and critic, it provides an in-depth look at how Manhattan influenced Parker and how the writer held sway over her favorite city. The foreword is by Marion Meade, the author of Dorothy Parker: What Fresh Hell Is This? (1988) and editor of The Portable Dorothy Parker (2006).